Circles & swirls with Z. Whilst N holds Leah’s hand & cries in the background. 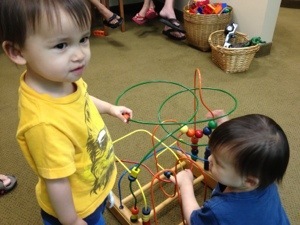 This is of the girls playing in the waiting room before the intense crying began. Even though they were okay waiting they really knew something was up. I tried to keep an open mind that I wouldn’t be as bad as I thought it would. The girls would calmly open their mouths for the examination, cleaning and fluoride treatment. Yeah right. Both girls started wailing as soon as we approached the examination room. It was not pretty. Snot, tears, being held whilst the treatments took place and much pointing at the door indicating they wanted to leave. They also pointed out the window at the car park to reiterate the point that they were done and could we go now. Once everything was over for both girls they calmed down. I think had Naomi been on her own she would have calmed down faster but separating causes more tears so we just knuckled down to get through it. Both girls have all their teeth bar the 2 year molars. Zoey in fact has an extra tooth (and an under bite). Of course she does. Getting one over the tooth fairy and Naomi. They got a goodie bag of a toothbrush and toothpaste and seem a little more into dental hygiene at the mo.